Each year, the PCTA works with more than 100 individual agency units within the U.S. Forest Service, Bureau of Land Management, National Park Service, and California State Parks. Our agency partners represent an unmatched pool of professional talent and passion. Their attention, at all levels of their ranks, makes the Pacific Crest Trail what it is. Friends and partners, in the truest sense. It truly does take a community to make the PCT. The time they devote to the trail is immense. With their attention and professional dedication, they are heroes of the trail. Our partners fight fires, help hikers and manage the health of the forest ecosystem and the experience of the trail so that it’s passable and protected for generations to come. We honor exemplary individuals with the Agency Partner Employee Award. In 1993, a Memorandum of Understanding between the PCTA and our agency partners was established. This agreement recognized the PCTA as the major partner of the Forest Service, Bureau of Land Management, National Park Service and California State Parks for the PCT. The agreement facilitates the management of the trail, coordinates the development and distribution of educational materials and encourages volunteer involvement. This collaborative partnership produces outstanding on-the-ground results and contributes to the long term sustainability of the PCT. The trail was designated by Congress as a National Scenic Trail in 1968. This act provides the trail with special status and priority and it enables the work of our agency partners. The U.S. Forest Service and the PCTA are partners in the truest sense of the word. The U.S. Forest Service has overall responsibility for managing the Pacific Crest Trail. The mission of the Forest Service is to “sustain the health, diversity, and productivity of the Nation’s forests and grasslands to meet the needs of present and future generations.” The Forest Service became the lead agency in charge of the trail with the National Trails System Act of 1968. 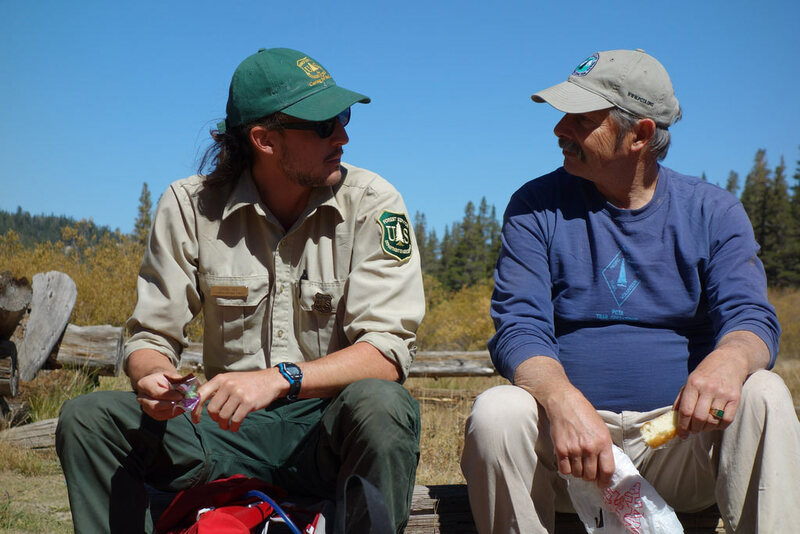 To guide the management and protection of the trail, the Forest Service has assigned duties to a full time PCT Program Manager. This office coordinates all aspects of trail management, from partnerships to maintenance. The large majority of the Pacific Crest Trail lies on lands for which the Forest Service is the public steward. Please visit the official U.S. Forest Service Pacific Crest Trail website. The Bureau of Land Management manages sections of the Pacific Crest Trail primarily in southern California and southern Oregon. The BLM has protected these sections by classifying them as part of the National Landscape Conservation System. Lands in this system offer exceptional opportunities for recreation and solitude. Some of the landmark sections of the Pacific Crest Trail pass through national parks. Kings Canyon, Sequoia, Yosemite, Lassen and Crater Lake are only a few. Park Service employees have been closely tied to the trail since it’s birth in the 1930s. The trail passes through five California State Parks: Castle Crags and McArthur-Burney Falls in Northern California; and Silverwood Lake, Anza Borrego Desert and Mt San Jacinto in Southern California. Our partners at the California State Parks leverage their time and passion to ensure that this national trail is at it’s best while on state lands. The California State Parks are guided by their mission “to provide for the health, inspiration and education of the people of California by helping to preserve the state’s extraordinary biological diversity, protecting its most valued natural and cultural resources, and creating opportunities for high-quality outdoor recreation.” Nowhere is this more true than on the Pacific Crest Trail. While the 10 PCT miles that cross Washington State Department of Natural Resources lands near the Gorge are officially managed by the U.S. Forest Service, the Washington State DNR works with PCTA and the Forest Service when issues arise concerning the surrounding lands. These lands are managed primarily for timber revenue, but because the Washington State DNR recognizes the public value of the PCT, they strive to minimize negative impacts that their timber management practices might have on trail users. Similarly, the 25 PCT miles that cross the Warm Springs Indian Reservation between Mt. Hood and Mt. Jefferson are officially managed by the U.S. Forest Service. The Tribes work with PCTA and the Forest Service when issues arise concerning the surrounding lands. In recent years these partners have also collaborated on programs such as a Warm Springs PCT Youth Crew.